Green Fairy Quilts: Winners!!!!!! Oh and Sherri's quilt............and some Bliss! Winners!!!!!! Oh and Sherri's quilt............and some Bliss! WOW - what a great giveaway! Thanks everyone for leaving a comment. So glad you all wanted the Fat Eighth Bundle. And the winner of the $30 gift certificate to our Website is Paulette - aka Sweet P.
Thanks so much ladies for entering my giveaway - be sure to email me at judi@greenfairyquilts.com with your address and I will get those sent right out! 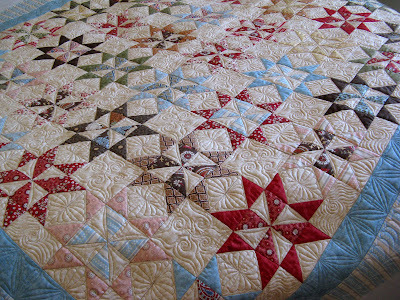 This is Sherri's quilt and I believe Camille's pattern and fabric. Beautiful quilt! I love it and had fun quilting it. Sherri is an awesome piecer. 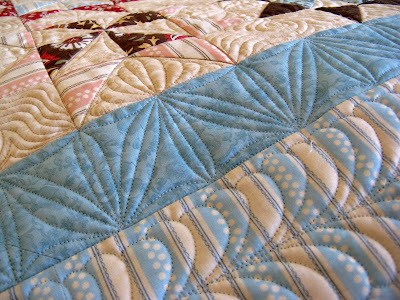 Everything is so straight - I love a straight quilt - makes life easy with the long arm quilting! Especially with all the stitch in the ditch I did on this quilt. I can't get enough of this first blue border! I haven't done a border like this before and it turned out perfect - at least I think so! There you go Sherri - I hope you like it! 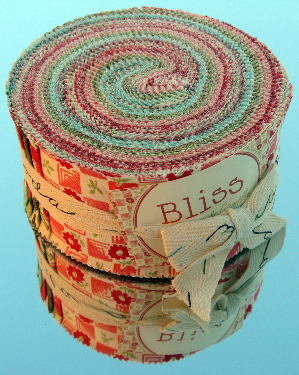 Since pretty much everyone that commented on my giveaway said that they like "Bliss" the best - I thought I would let you know that we got some more "Bliss" Fat Quarter Bundles, Jelly Rolls and Charm packs in. Yahooooo!! I can't believe I won!! I have got to thank my followers for mentioning my name!! Whoooptee-do!! Your quilting is beautiful! May I ask what kind if thread you used on Sherri's wonderful quilt? Stunning quilt AND quilting.The border does look great. Judi...it's absolutely gorgeous!!!! I love it! WOW! Thanks so much! (okay...too many exclamation points, I know...but it's wonderful)! Judi, your quilting is out of this world. I seriously don't know anyone as amazing as you. Blows my mind. That quilting is absolutely unbelievable! The quilt is gorgeous already, but with that quilting....oh my gosh! Sure makes my free motion meandering that I do look crapy! absolutely gorgeous! I love how the designs really stand out on the white. Congrats to the winner! The quilt is just gorgeous. Both the quilting and the piecing! Beautiful quilt and fabulous quilting, but more importantly I get paid this weekend and I see some charm squares or something coming my way! Oh wow!!! How exciting. Thanks for the great giveaway. Your quilting always amazes me and this quilt is no different. 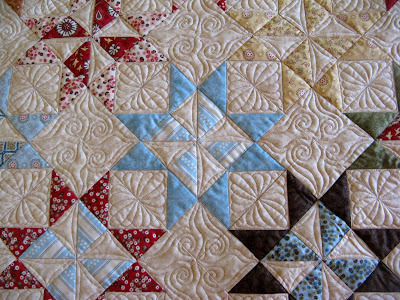 The piecing is also fabulous and done to perfection. 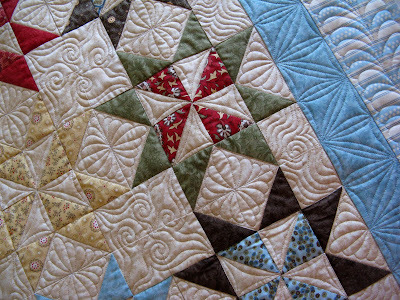 Absolutely beautiful quilting!! Gorgeous quilt and CONGRATS to the winners :) Happy day to you!!! Congratulations to the winners!! 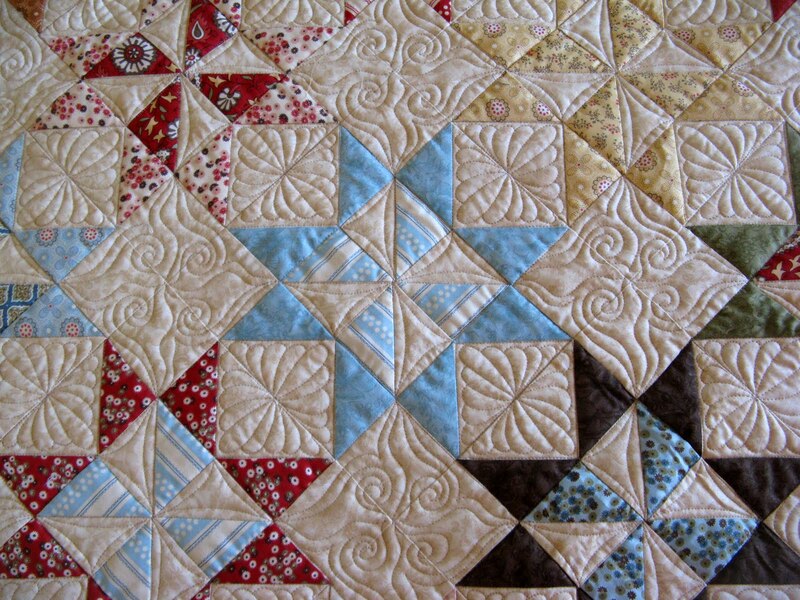 Stunning job of quilting - as always! Sherri's quilt is AMAZING! Your work is gorgeous! Good job! I'm sure that took some time! Love it! It is great to (virtually) meet another Utah quilter-I'm in Moab. Your FAQ's were very informative. Hope you'll have a chance to visit my blogs-utah quilt appraising and my art and reproduction quilts. What's not to like, that quilt is awesome.. Your work is unbelieveable..